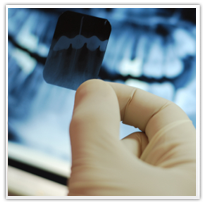 The introduction of x-ray technology in dentistry has helped improve dental treatments and prevention of decay and cavities. Even with a trained eye, many dental issues cannot be seen from the surface of the tooth. In cases like these, being able to take images of the inside of teeth helps dentists figure out what might be causing the pain and discomfort for patients. Dental x-rays are especially important in orthodontics, where new teeth cannot be seen through the gums except with x-ray imaging. Some patients are concerned with the potential risks of radiation from dental x-rays. Luckily, nowadays the restrictions on x-ray radiation are very strict and patients experience very little exposure if any at all. If you have questions about dental x-rays or would like to learn more about their effect on your health, call our office at (949) 760-0363.